Phirni is a North Indian dessert that is very similar to the kheer. The difference is that phirni is made using ground rice while kheer is made using whole basmati rice, kheer can be served hot or cold, but phirni is always served chilled. 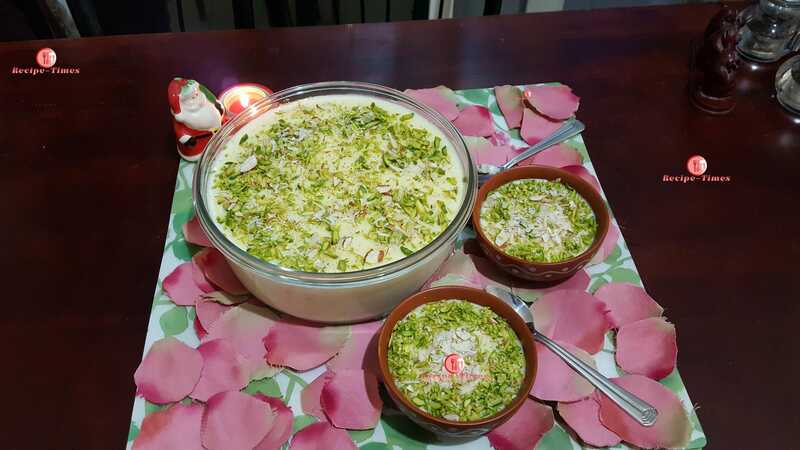 It is an important part of a lot of Indian festivals and occasions, it is also an important part of Muslim wedding and festivals.Traditionally phirni is served in small earthenware pots. First, soak rice for 1-2 hour, drain water and grind rice with little water to make a fine paste. Take a heavy based pan on heat, add ghee, cardamom powder, milk and keep the heat high once milk starts boiling then add rice paste mix it well. Cook for 25-30 minutes stirring continuously on low flame, if stirring is not done not properly lumps can be formed. When it starts to thicken then add saffron and sugar and mix it thoroughly, turn off flame. Phirni is ready, pour this mixture into a glass bowl and add rosewater, kewra drops then garnish it with silvered almond and pistachios.